This self-contained hardware unit stores a test card image (or any colour still picture) plus four teletext pages, and outputs them as a 625-line baseband PAL composite video signal. Although supplied pre-programmed with the test card image shown below, a software program is included (compatible with Windows 98, Me, 2000, XP, Vista, 7, 8 or 8.1) which allows the user to reprogram the generator with any image and text pages of his choosing! Digital storage, using 12 MHz sampling and 8-bits linear coding. 'Mathematical' PAL coding, ensuring compatibility with all 625-line PAL equipment. Stores one still frame (8-field PAL sequence) and four teletext pages with Fastext links. Integral vertical-interval test signal (pulse and bar). Integral line 23 Wide Screen Signalling. Supplied pre-programmed with colour test card and informative text pages. User programmable using Windows™ software supplied (see below). Baseband video output, suitable for feeding a monitor, VCR or TV. 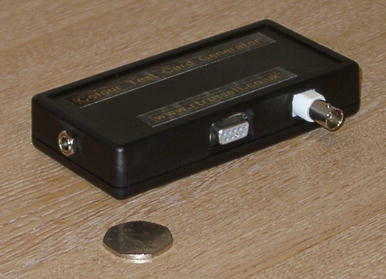 Approximate size, excluding connectors, 130 x 65 x 25 mm. Weight 140 g.
Output on 75 ohm BNC connector. BNC-phono adaptor supplied. Supplied with a 230 Volt 'plug top' AC mains adaptor. Alternatively may be powered from 9 Volts DC at approximately 150 mA. Additionally supports 180, 405, 441, 525 and 819-line operation. Erase the image stored in the generator. Reprogram the generator with any BMP, JPEG, GIF or raw YUV image. Load, save, compose and edit the teletext pages (including sixel graphics). Select colour (PAL, NTSC) or monochrome output. Enable or disable teletext, Fastext and insertion test signals. Program the Fastext coloured buttons. Configure or disable the line 23 Wide Screen Signalling. Select 625, 405, 441, 525, 180 or 819-line operation. Note that a fully-wired serial port extension cable (9-pin male-female) is required for programming the generator. This is not supplied. Transfer the money directly to our bank account. If you want to use this method contact us for our bank details. Wire the money using Western Union Money Transfer or MoneyGram. Note that the units are manufactured to order; please enquire for current availability and allow up to two weeks for delivery. The current version of the programming software is 3.2f. You can download the software, either to update your existing version or to try it before you purchase the generator. For more information about the Test Card Generator see the online manual, which is also supplied with the programming software.